Or “how maths can increase the dramatic tension of Reality TV competitions”. Below is a hierarchy of increasingly dramatic (and mathematically complicated) systems for a reality TV competition such as “Britain’s Got Talent” or “Strictly Come Dancing” to announce their competition winner. Just one rule is needed for creating each system of announcements from the previous one: in mathematics this concept is referred to as RECURSION. RECURSIVE STEP: to create the next level, we replace each single announcement of the previous level with a set of announcements of all the other contestants! LEVEL 4 SYSTEM: In place of each “such and such a person is safely through to next week” announcement, we announce instead all the contestants who are not safely through to next week – let’s call them “level 4 losers”. This isn’t as bad as being a level 2 loser: it’s a set back but just means you’re not yet safely through to next week. LEVEL 5 SYSTEM: In place of each “such and such a person is a level 4 loser” announcement, we announce instead all the contestants who are not level 4 losers – let’s call these folks “level 5 winners”. These contestants are spared the indignity of being a level 4 loser, and can now look forward to the moment when, all the level 5 winners having been announced, the last remaining contestant is confirmed as the level 4 loser. After surviving several such rounds, they may even become a level 3 winner, in which case they’re safely through to next week! LEVEL 1: there is just one announcement to make: the competition winner. As it happens, you can find a whole bunch of ones down the first diagonal of Pascal’s Triangle (see below). LEVEL 2: assuming a modest competition of, say, 8 contestants, a level 2 system will require 7 “elimination” announcements. Seven – the sum of seven ones – is the seventh INTEGER, (whole number), and can be found in the second diagonal of Pascal’s Triangle. LEVEL 3: assuming again that we start with 8 contestants, there will be 7 “level 3 winner” announcements before just one contestant remains and is eliminated from the competition; we then announce 6 “level 3 winners” to reach the next eliminee, and so on, making a total of 7+6+5+4+3+2+1=28 level 3 announcements. 28 – the sum of the first 7 integers – is the seventh TRIANGULAR NUMBER, and can be found in the third diagonal of Pascal’s Triangle. LEVEL 4: starting again with 8 contestants, we make 28 “level 4 loser” announcements to reach the first level 3 winner, then 21 level 4 announcements (the 6th triangular number) to get our next level 3 winner, then 15, 10, 6, 3, 1, totalling 83 annoucements all in. 83 – the sum of the first 7 triangular numbers – is the seventh TETRAHEDRAL NUMBER and can be found in the fourth diagonal of Pascal’s Triangle. LEVEL 5: similarly, this system would require 210 announcements, this being the seventh PENTATOPE NUMBER. 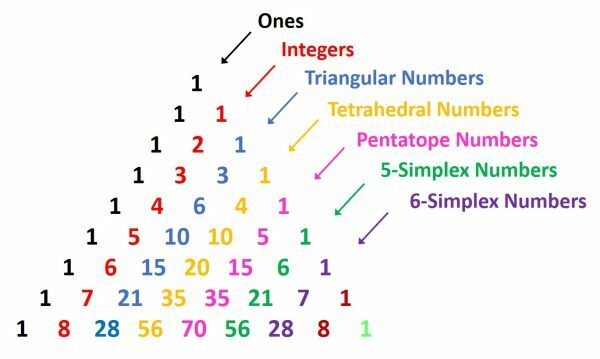 Pentatope numbers are calculated as the sum of the first n tetrahedral numbers, and they reside in the fifth diagonal of Pascal’s Triangle. LEVEL 6 and above: in subsequent systems, the total number of announcements would be the seventh “5-simplex”, “6-simplex” etc number, these residing in subsequent diagonals of Pascal’s Triangle. If this all seems a needlessly complicated, you might consider that Level 3 systems seem to be the standard on Reality TV shows, even though a Level 1 system would be perfectly adequate for finding the overall winner. How, I wonder, would the viewing public react to a level 4 system? HOW MANY GIFTS IN TOTAL IN “THE TWELVE DAYS OF CHRISTMAS”? WHY ARE THE STONES AT GIANTS CAUSEWAY HEXAGONAL? WHAT’S SPECIAL ABOUT THE NUMBER TWO? WHAT’S SPECIAL ABOUT THE NUMBER ONE? HOW MOST PEOPLE CAN BE “BETTER THAN AVERAGE”! WHY IS x USED FOR THE UNKNOWN IN ALGEBRA? WHICH IS BETTER: METRIC OR IMPERIAL? HOUSE OF MATHS MAKES THE NATIONAL NEWS! WHAT IS THE POINT OF ALGEBRA?